Sometimes at Pleasant Pops we run out of ice. Our ice machine is quite modest, squeezed behind the counter, constantly churning out ice that’s charmingly shaped like mini mushroom caps. We were able to choose the shape, and yes, we went with mushroom caps. We love our ice machine, and many months out of the year it satisfies our needs. However, as the summer months quickly approach, and our iced cafe drinks get more and more popular, we know our ice will soon run low. It’s time to buy some extra bags and keep ‘em in the freezer. That ice may not be shaped like mushrooms, but it’ll do the trick and keep our Cold Brew Ice Coffee, unsweetened black Iced Tea, Opal Basil Lemonade and Hibiscus Iced Coffee perfectly crisp and quenching. Let’s begin with the coffee. Since we love our coffee strong and vibrant, it was an easy choice to use Ceremony Coffee Roasters’ Mass Appeal Espresso for our ice coffee. By cold brewing the coffee grounds, letting the taste extract over 12 hours in our special carafe (lovingly called “Toddy”), we are able to ensure our ice coffee is naturally intense. Without losing any flavor (or caffeine) by diluting hot coffee over ice, our cold brew method is impeccable. Using a lighter roast coffee, Ceremony’s Apolo from Bolivia, we have created a new drink that will send your tastebuds all over the place. 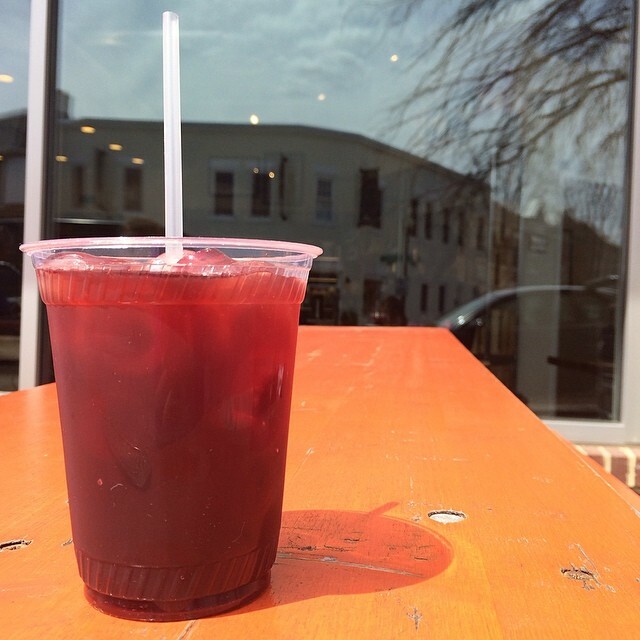 The Hibiscus Iced Coffee is wild: a perfect combo of tart and fruity hibiscus tea matched with the delicate, almost nutty, cold brewed Apolo coffee. Though neither is too sweet, the drink presents itself with a perfect flavor balance, needing no milk or sugar, just ice and a straw. For those seeking something cold and refreshing without any caffeine, we’ve concocted the Opal Basil Lemonade. Naturally pink from the deep purple of the basil, our lemonade, or OBL for short, is beautiful and tasty. I grew up on lemonade (and water, but more on that in last week’s blog) and think our OBL is spot on. If you’re craving the sweetness of lemonade, but also need a caffeine boost, I’ll happily suggest a classic Arnold Palmer: half lemonade and half ice tea. Our ice tea is simple and classic; black iced tea brewed and cooled, unsweetened and straightforward. If that’s how your like it, awesome! If not, we’ve got plenty more treats for you to try out (aka our Vietnamese Iced Coffee Pop!..but more on that later).